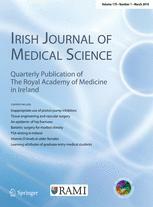 The above named article is to be retracted from the Irish Journal of Medical Science. As a result of poor communication, the manuscript was submitted to Neuroradiology whilst still under consideration by the Irish Journal of Medical Science, and subsequently published online by Neuroradiology on 26th May 2009. The article was published online within the Irish Journal of Medical Science on 20th August 2009; due to being the latter of the two article versions, the Editor-in-Chief of the Irish Journal of Medical Science has decided to retract the article. Readers wishing to access the article content can do so at Neuroradiology, August 2009, Volume 51, Issue 8, pp 525-529, DOI: 10.1007/s00234-009-0537-4. Lu S, Kong C, Hai, Y, et al. Retrospective Study on Effectiveness of Activ L Total Disc Replacement: Clinical and Radiographical Results of 1- to 3-Year Follow-up. SPINE 2015 40(7): E411-E417. DOI: 10.1097/BRS.0000000000000773. SPINE retracts this article from the literature because the article was submitted to Journal of Spinal Disorders & Techniques on September 27, 2013 and submitted later to SPINE on October 28, 2013. The authors were in violation of their copyright agreement when they submitted to SPINE after submitting to Journal of Spinal Disorders & Techniques. The authors originally contacted Wolters Kluwer about dual publication in 2015 and requested a retraction from Journal of Spinal Disorders & Techniques. The article was accepted by Journal of Spinal Disorders & Techniques on November 19, 2014 and posted on Publish Ahead of Print on December 20, 2014. After revision, SPINE accepted the article on December 16, 2014 and published it in the April 1, 2015 issue. As the duplication violates the publication policies of the EJSO and the Editors have not received an adequate response from the authors as to the reason for the duplication, the article has been retracted from the journal. Asiye Abasian, Ahmad Golchin, Mohsen Sheklabadi & Ali Beheshti Alagha, Distribution of carbon, nitrogen, carbohydrate and calcium carbonate in aggregates of histosols in Shahrekord, Iran, Archives of Agronomy and Soil Science 61(11): 1625–1639,http://dx.doi.org/10.1080/03650340.2015.1021338. Published online 15 March 2015. Abasian, M.A. Delavar, A. Golchin and A. Beheshti Alagha, Aggregate stability in relation to carbon, nitrogen, carbohydrate and calcium carbonate content in histosols. Journal of Soil Management and Sustainable Production. 4(1), 1–26,http://www.sid.ir/fa/VEWSSID/J_pdf/5001013930101.pdf. Published in 2014. This action constitutes a breach of warranties made by the authors with respect to originality and of our policy on publishing ethics and integrity. We note that we received, peer-reviewed, accepted, and published the article in good faith based on these warranties, and censure this action. Gamil Abd El Fattah Amin, S. Ali Bazaid, Narmen Ahmed Youssef & Waleed Diaeddeen Saleh, Assessment of insecticidal activity of red pigment produced by the fungus Beauveria bassiana, Archives of Agronomy and Soil Science 57(4): 435–443, http://dx.doi.org/10.1080/ 03650341003587206. First published online 27 May 2011. Since the above article was published online, we have been made aware that an earlier version of this paper was published: Gamil A. Amin, Narmen A. Youssef, Saleh Bazaid, Waleed D. Saleh, 2010, Assessment of insecticidal activity of red pigment produced by the fungus Beauveria bassiana, World Journal of Microbiology and Biotechnology. 26(12), 2263-2268, http://dx.doi.org/10.1007/s11274-010-0416-5. First published online 29 April 2010.